Can You Learn From Your Electric Smart Meter? What exactly is so smart about electric smart meters, and what can you learn from them? Unlike, traditional electric meters, smart meters take advantage of a series of wireless technologies in order to communicate electric use data all the way from the residence to the power company. It’s with this advanced two-way communication that smart meters are able to provide such an array of benefits over traditional meters. 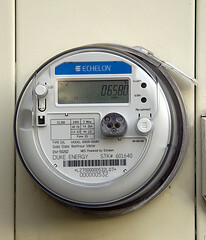 Traditional meters have analog dials that require employees of the power company to dispatch to each residence in order to collect electric use data. Not only are the dials difficult to read, but resource constraints often result in electric use data being estimated on the consumer bill. Smart meters also have a digital display that shows the electric use data as the actual numeric value, allowing for simple reading by the consumer. Electric use data is transmitted wirelessly and securely back to the power company in 15 minute intervals which equates to accurate billing for the consumer. If you’re like me, you probably don’t enjoy the inflated electric bill that goes hand in hand with your beautiful Christmas lights and holiday decorations. There is no better time then now to start looking into ways we can all lower our carbon footprint while shaving a few dollars off those dreaded electric bills. The technology is here, alternative energy is available, and some of the power saving solutions are simply wild! I’m not quite ready for alternative energy, but I’d still like to lower my electric bill. What can I do? For those that are not ready to harness up alternative energy sources just to power up their Christmas lights, there are still a couple of good ways to save some power and knock a few bucks off the old electric bill. First of all, with all the hustle and bustle during the holidays, it’s easy to forget to turn those lights off. Make sure to use timers to limit the amount of time your lights stay lit. Another great way to save energy is to invest in LED Christmas lights. LED Christmas lights are not only more durable then those fragile incandescent bulbs, but they last 1000’s of hours longer and use up to 33% less power. LED lights also produce less heat then incandescent bulbs, which makes them much safer on your Christmas tree. Between some energy efficient LED lights and automated timers, you’re sure to save a few bucks on the electric bill this year. I’m ready to go green this Christmas, so where do I start? Does Your Home Qualify For Free Solar? Alternative energy sources, such as solar, is a great step towards sustainable living. Wouldn’t it be great if you qualified for free solar energy for your home? Well hang on, because depending on where you live, you just might! I know that sunlight is free, but how do I get the hardware for free? The hardware isn’t exactly free, but there are a few companies offering $0 down power purchase programs. The solar companies find investors and banks willing to front the money for a large number of installations so that you as the home-owner do not have to go out and secure a loan just to install solar on your home. Once installed, you simply pay monthly for the electricity by the kilowatt hour just like you currently do. The benefit is that you are now paying a lower monthly rate for clean renewable energy and your savings will simply increase over time. OK, so how do I qualify for one of these $0 down power purchase programs?